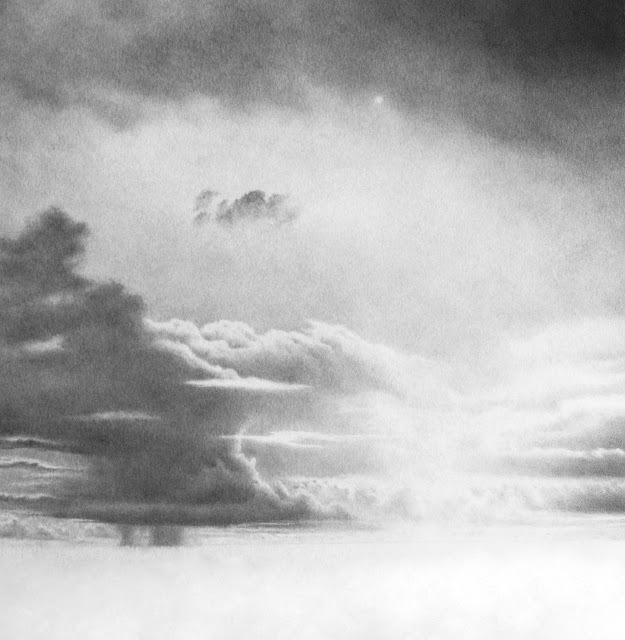 The weather kept Alan inside, so he spent the next several days working on this drawing. The sky is nearly completed, and next are the surf and beach. The sky stayed gray, and a chilly wet wind brought showers and mists on and off for several days. Alan spent the time at his table, making a drawing, and trying not to feel too bummed about the weather. During a lull in the mist, he walked down to the beach to sketch the waves. The water was catching the pale light from the broken sky as an obscure sun tried to break through. The challenge of doing this in graphite, with some odd drafting pencils he had brought along, helped keep his mind off of his isolation blues. During another lull, Alan needed a break and some company. (I'm not a hermit!) Adrian hadn't been in his gallery for the last three days, so Alan put down his tools, rummaged in his kitchen for some crackers and cheese, and walked the mile-and-a-half to Adrian's house. It turned out Adrian had company. There was a tiny blue private car parked next to Adrian's bike, and when Alan knocked on the door, a tall, very dark-skinned woman opened it. Adrian was right behind her, and he said, "Oh, Hi, Alan...Um, Joanna, this is Alan, the guy I told you about who lives above the gallery." Joanna graciously smiled, offered her hand, and said, "Come in, Come in," and Alan sheepishly smiled back at them and walked in. Alan hadn't heard about this Joanna person, and he felt embarrassed at having barged in unannounced. "I...I hadn't seen you in a while, Adrian, so I thought 'd come over and say Hi...Uh, good to meet you, Joanna." Alan soon got a vibe that these two were wanting some privacy. " I probably should have called you, maybe on your gallery phone..."
"Oh, that's fine Alan, I'm glad you stopped by. Everything is okay there, right? Um, I've just been a bit busy since Joanna's been here. As a matter of fact, we were just getting ready to go to Victoria for a few days, but otherwise we'd love to have you stay for a chat." "Oh. Yes. Everything is fine...uh, okay, well, you guys have a nice trip," and Alan backed out towards the door, then, "Oh, can I borrow your bike again?" Alan was intrigued more than put off by Adrian's abruptness. He was happy to get the bike, and proceeded to ride it directly into Hazel. There he bought some groceries for a few more days of hunkering down, since the rains weren't showing any sign of ending soon. As he was riding back to his lodgings, a steady drizzle had resumed, but at least the wind had died down. The beach on Putney Bay, below Alan's apartment, on a rainy day. Early the next morning Alan heard rain on the roof. Around 4 am he was awakened by a dream where he was in a room somewhere, being angrily chastised by his mom. His ex-wife Barbara and Michelle were there beside her; they didn't say anything but they seemed to be siding with his mom like a panel of judges. He couldn't remember what the issue was about, but it brought up memories of similar actual events when he was a kid. Once it was light outside, he got up, wrapped a blanket around his shoulders and looked out his front window at the heavy clouds and dark water. The waves looked pretty rough for this part of the bay. 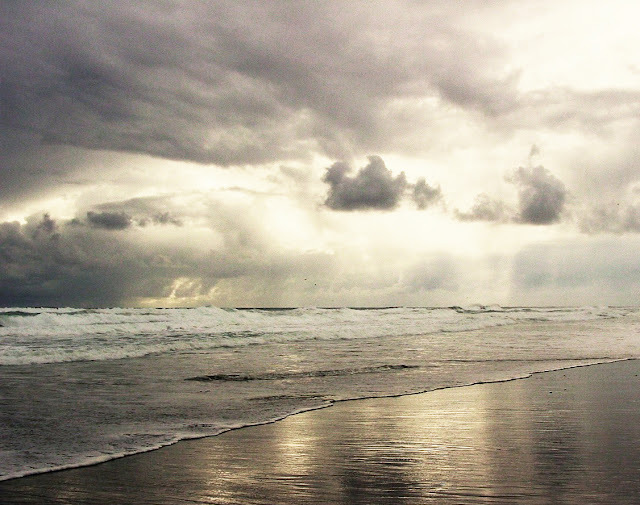 The dark beach and murky sky triggered those feelings of isolation that have been bothering him. He worried that he might possibly be a loner, a recluse, perhaps a hermit at heart. But he knew he wasn't a misanthrope; he really did like people in general. He realized that maybe he was simply not that attentive or tuned in to those that he was close to. And now he is on this island that seems to be separated by more than just miles from anywhere he has been before. Is the whole place on some other plane of existence? And so, therefore, is he? Are his mom and Michelle (and the real world) completely out of reach? He's not sure how much of this he wants to know! And then again he feels real enough here, and everything, including the friends he's met, feel real enough too. That's something. 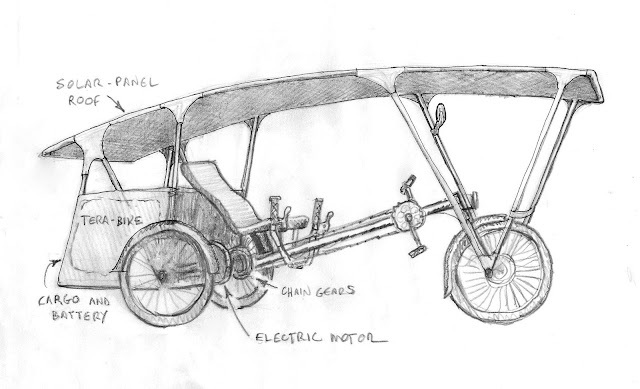 Sketch of a Tera Bike solar-powered road and path conveyance. then adds the solar-roof, battery pack, electric motor and the cargo bay. and carries 350 lbs. The battery will last up to two hours with no pedaling. After the library, Alan rode over to Rothschild's Bike Shop to look at bikes. Several ancient-looking bicycles, with 1950s-style frames and trimwork, were lined up in front of the shop. They were so nicely restored that Alan thought that this might be a collectors' bike boutique! However, a good-looking used Malvern Outback with fat tires, one gear, and a large wire front basket was tagged at 2 rogers, 500 pence, or, "2/500". That seemed cheap enough. A friendly-looking older fellow approached, and said, "Hello. Don't know if I've seen you before..."
"Oh, Hi. I'm Alan. I'm staying above the art gallery down the road." They shook hands. "Good to meet you, and yes, I know the place. I'm Rothschild, and how can I help you?" "I see. For just you or will there be cargo? For short trips or long? Over flat land or into the Highlands?" The questions gave Alan pause. 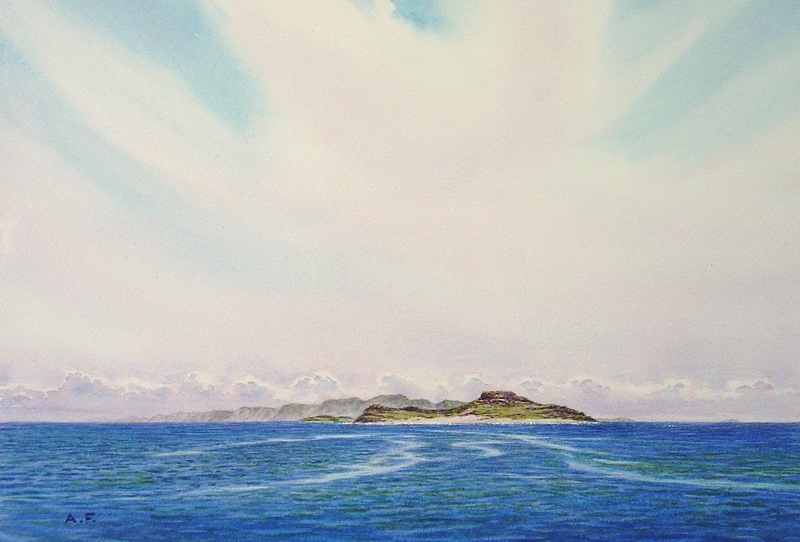 "Well, I have to go all over the island in the next few months, with my supplies, and sketch pictures for the Tourism Office. I can travel by train here and there but most of these places are path-access only. I just came back from my first trip out to the Hook and to Capetown, and it took days just to get to one spot to the next. I'm thinking that a good bike might save time..."
"Ahh, walking is fine for the young people, and these bicycles are okay for a trip to town, but you, young man, could use a true overland conveyance!" 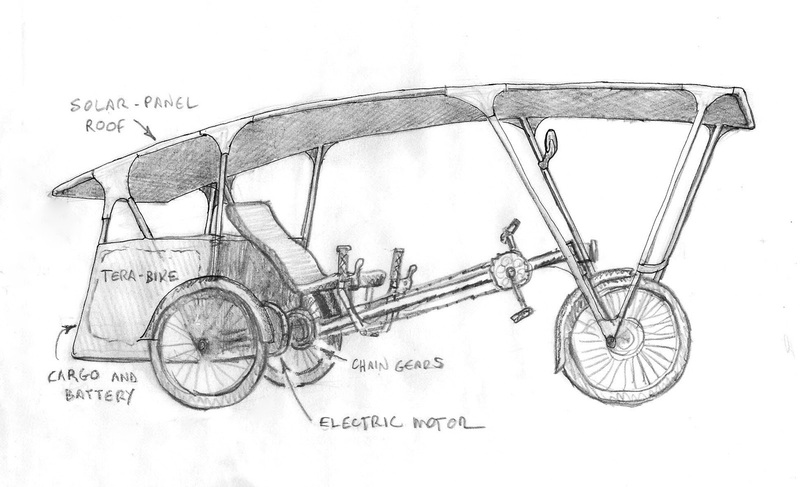 He then led Alan inside the shop to a display of solar bikes - long, low, three-wheeled contraptions with cargo bins behind the seats and roofs covered with photo-voltaic cells. "These beauties are built by the Hilltop tribe, outside of Putney. They import Kettwiesel Eco trikes from Hase Bikes, a company in Germany. Hilltop started their own Tera-Bike Works in 2007 to adapt recumbent bikes into solar-powered path conveyances. The roof carries enough cells to give these bikes a powerful boost, plus offers weather protection, especially from the sun! The cargo bay behind the seat holds about 100 lbs of gear. It rides like a dream...would you like to take it for a spin?" Alan could tell this was a sales pitch, but he was nevertheless enchanted. "Hmmm, I think this is just what I need! Uh...how much for one of these?" "Oh, take it out for a ride first, then we'll get into that..."
Alan watched as Rothschild wheeled an electric-blue solar bike out the front door. "It's easy enough - just climb into the seat, pedal with your feet and steer with these steering handles. These grips are the brakes. Down here is a switch to turn on your motor to help you get up the hills, or just cruise without pedaling. This thing will ride over rocks and bumps and does well on soft ground. We've even added a handle in front so you can pull it out of the mud!" The bike felt heavy as Alan moved it into place to climb in, but it pedaled easily out onto the street, and was also easy to turn. Sitting low, he felt much more at ease than on a regular bicycle - he could stop and just sit in it without putting a foot out. "Wow, I like this thing. The price?" "For you, 99 rogers, and I'l throw in a water bottle for free." "Umm, okay...I'll have to think it over. Spirit Island with North Cape in the distance. Alan was only beginning to grasp the actual size of New Island. Alan felt a little better the next morning, though something unsettling was running through the back of his consciousness. But once he had his coffee and started thinking about the day ahead, his murky feelings of whatever unsettled him subsided. He decided he should mail his first portfolio of pictures to the Tourism Office. He had heard Adrian moving around downstairs so he went down with the pictures and his mug of coffee in hand to say hello. Adrian was just pouring his own coffee when he looked up, smiled at Alan, and motioned to the two chairs in the gallery. They both sat a minute, then Adrian said, "Soooo, what are your plans for now? ...I'm just curious." Alan's mind had drifted off. "Oh! Well, yesterday I saw the library in Hazel, so I'm going there today to get something to read. I suppose I'll need to get a card. I also want to mail my drawings to Margaret at the Tourism Office. Then I'm going to hang out here for a couple of days before I head north toward Putney, where more places are waiting for pictures." "Wow, leaving again so soon..."
"Oh, and here are my first batch of sketches..." Alan spread them out on the floor between them. Adrian looked them over carefully, picking each one up. "Whoa, not bad! I can recognize these places easily. I think they'll like these." Alan let out a deep breath, or a sigh. "Thanks. It seemed to take forever to get these first nine done! That tenth one I painted on my way over on the boat. Anyway, I feel like I'm going to be wandering around for a loooong time to get to all the 105 places that they want pictured! At first, I thought the island would be easy to walk across in a couple of days, but now I see it's much bigger than that!" "Yes, here is the list - the one I showed you before I started out." Adrian studied it much more closely than the last time he saw it, looked at the pictures on the floor again, and then he said, "You know, I've been thinking we could collaborate here. I've noticed our styles of landscape painting are similar - and I have already made paintings of several of the places on your list. I was just thinking that maybe we should slip in some of my work to help free up your load. I'll be able to get rid of some old art, and you'll get the credit! Also, I could also use the income. Do you think they'd mind?" "Hmm, dunno. I could ask about it in a letter and slip it in with the pictures. That would help me get these done a little sooner. By the way, they are only paying me five rogers each for these. Will that be enough?" "Five rogers? They're getting a good deal, in my opinion! It'll have to do, I guess." They sat in silence for another minute, then Alan gathered up the sketches. "Um, I should probably buy my own bike, but can I borrow your's again to go to Hazel? "Oh, sure. I bought mine from Rothschild's bike shop in Hazel, which has a lot of used bikes and a few new ones. It's around the corner from the grocery shops. And that's a fine library in Hazel. They have a surprisingly large selection of books and movies put out by our locals." So Alan mailed the sketches and a long note to Government Hill, and then rode over to the Hazel Library. Getting the card might be a problem - he realized he didn't have an official street-number address. The Librarian, a lovely young woman, allowed him to write "The Apartment above the Gallery on the Road west of Town." on his card application. "Now I'm almost a resident," he grinned as she stamped his card. As she handed it to him, she replied, "Probably more than you think, Mr. Faramond." Her statement startled Alan, but beyond, Hmmm...I wonder what she meant by that? he mentally set it aside. In the stacks he found a well-worn novel, The Magician's Assistant, by Ann Patchett, an American author he liked, and then spotted a hefty non-fiction volume titled 50,000 Years Ago, with a subtitle reading - Everyday life on New Island during the dawn of the Old People. It was by Harriet MacAuley, a resident of Putney. This should do it, he thought. Next stop, the bike shop.